Russian cat 'saves abandoned baby' Jump to media player A cat named Masha has become something of a celebrity in the Russian city of Obninsk after it alerted neighbours to an abandoned baby. 'Hero' cat saves owner from fire Jump to media player A tabby cat has been hailed a hero after she woke up her owner to alert him to a fire which destroyed his home in Melbourne, Australia. Christmas tree treat for zoo lions Jump to media player A zoo in Cambridgeshire is helping people get rid of their Christmas trees this year by donating the trees to the lions to play with. 'Cat burglar' caught in the act Jump to media player A cat from Vladivostok sneaked into a display of fish at a shop in Vladivostok International Airport. 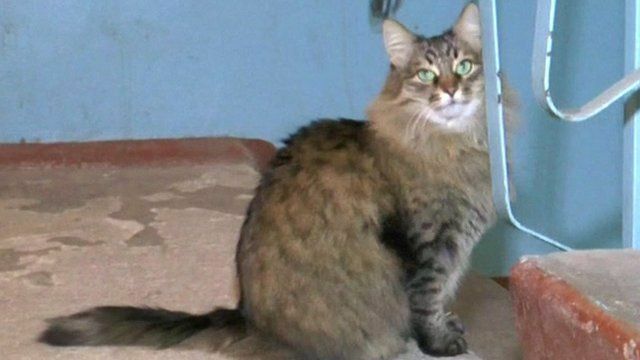 A cat named Masha has been hailed a hero in the Russian city of Obninsk, after being found with an abandoned baby. The boy, who is now being cared for in hospital, was found with a bag containing a change of clothes, nappies, and a bottle of baby milk.